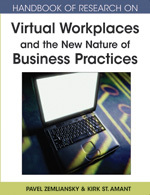 The chapter presents healthcare examples of the current virtual working environment and introduces nursing skills necessary for evidence-based practice in a virtual workplace. The authors discuss how the Nursing Information Literacy Program was designed and implemented at Three Rivers Community College to assist nursing students in developing skills such as critical thinking and problem-solving, technological literacy, information literacy, and collaborative and cooperative learning. The authors hope that this example will serve as a model for creating other information literacy programs that prepare students for working in a virtual workplace. E-Learning: This is a process of learning that is facilitated by, delivered by, and supported through information and telecommunications technologies. Technological Literacy: This is the ability to use computers and electronic equipment to meet objectives and goals and improve learning, productivity, and performance. Evidence-Based Practice: This is demonstrated by practitioners who make informed clinical decisions based on the best research evidence available, environment of practice, clinical expertise and the patient’s unique characteristics. Tele-Nursing: This is the practice of nursing over distance using telecommunications technology (National Council of State Boards of Nursing). Information Literacy: This is a set of abilities that empowers individuals to understand how the information is organized and to locate, retrieve, evaluate, and use information effectively and efficiently. Tele-Health: This is the use of telecommunication technologies and electronic information to facilitate access to medical and research information while providing healthcare services to clients across distances. Nursing Information Gateway: This is a portal that offers access to faculty- and librarian-selected print and online nursing sources of information, research tools, library services and professional organizations. Information Literacy Program: This is a planned, systematic process through which information literacy skills are thought and developed incrementally and progressively during a program of academic study. Information Competency: This is a set of skills that allows the individual to identify the information need, manipulate information efficiently and make informed, intelligent, ethical decisions in academic, professional, and personal life. WebCT Learning Module: This is a structured guide to course content, organized sequentially as a collection of interactive learning tools, assignments, and resources to promote effective learning.